In less than a year, Bruce Arians and the Glazers will go behind closed doors for an open dialogue. The subject of the meeting will be one Jameis L. Winston, who won’t be in the room but never strays far from the thoughts of ownership. After Winston’s fifth NFL season is complete, the Glazers figure to have a pretty good idea whether he is Tampa Bay’s franchise quarterback or a potential franchise wrecker. “Pretty good idea” isn’t good enough. They need to KNOW. The fact we aren’t sure right now tells you a lot about how uneven Winston’s pro career has been since the Bucs kicked off the 2015 draft by selecting him over Marcus Mariota. To be fair, neither quarterback has established himself as an elite player. Mariota lacks durability and star power while Winston has made too many mistakes and hasn’t won nearly enough. Both remain works in progress, each expected to play for $20.9 million in 2019 as the Bucs and Titans exercise their fifth-year options. 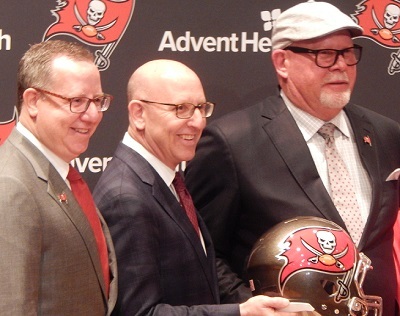 If the Bucs are 10-6 next season with Winston under center, Arians and the Glazers won’t waste much time discussing the quarterback position going forward. At that point, a long-term contract extension for No. 3 should be a formality, with only the details to be worked out with Winston’s representatives. What about the great middle? That’s where it gets tricky, and that’s where Arians needs to be brutally candid. Suppose the Bucs go 7-9 or 8-8? That’s not exactly a ringing endorsement for Winston, especially because Arians believes this is a more talented team than the 5-11 Arizona club he inherited in 2013. At the end of the day and at the end of the season, Arians needs to tell the Glazers what they need to know … not what they want to hear. If Winston’s not the guy, Arians and his 33-man coaching staff needs to pull the plug. It’s still an open question, and that’s why the Bucs should use a middle-round draft pick on a quarterback Arians thinks he can develop. Winston is understandably thrilled that Arians is the choice to replace Dirk Koetter. Arians couldn’t be more effusive in his praise for Winston — and that should restore some of the confidence lost during a lost season. But there are no guarantees Arians can curb Winston’s penchant for giveaways. Of all the quarterbacks with more than 320 pass attempts last season, Winston had the highest interception rate at 3.7 percent. It’s not too simplistic to suggest the 2019 Buc season boils down to Arians’ reputation and Winston’s future. Can Arians duplicate his run in the desert and can Winston prove his strong finish was no mirage? That Arians-Glazer postseason summit should be a doozy. Whether it turns out to be a Winston coronation or a shove out the door, honesty needs to rule the day. Anybody know Bruce Arians to hold his tongue? 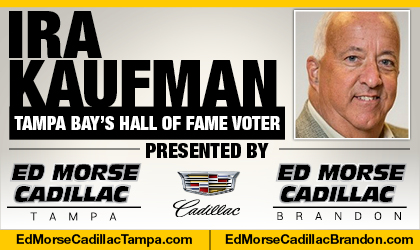 DERRICK BROOKS & IRA KAUFMAN talk about the BRUCE ARIANS hire on TAMPA TWO, presented by Caldeco Air Conditioning & Heating. I think this year will be far more about improving the rest of the team than Winston’s improvement….if he can simply hold where he was at the end of the season, that will be good enough. Look for the Bucs to have a much improved running game and defense. That is what will improve our record. No question this hire was best for Jameis moving forward with bucs. It’s tough to evaluate the middle 8-8 debate when so many things can happen, mainly injuries to key guys. The eye test will be easy to spot though. .
Just as most people so far , except a few of certain group, have seen average /middle of the road results; You see the wow how did he do that and then the same ole stupid stuff. No question he was better after benching. Just worried about the risk it no biscuit for someone that has given up the biscuit more then any other qb since entering the league. Also, both Arians and Koetter run those verticals downfield offense style. However , arians is smart enough to know what will work best for Jameis. Ira, you’ve been around a long time. To say “…and that’s why the Bucs should use a middle-round draft pick on a quarterback Arians thinks he can develop. 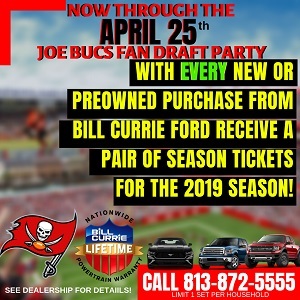 When in the history of this franchise have the Bucs had a low round, high round, or any round pick that was “developed” by this team and went on to some kind of sustained success? I don’t see that as being the answer, but also see where you would have to dream that it would actually work out for once. I still think with any kind of help around him in previous years, such as, say, a defense that prevents points, or a kicker that knows his job is to put the ball between the goal posts and not outside them, then the team and Winston’s record would have been respectable enough to not make Winston such a target. WIth that said, surely he needs to show much improvement next season. I believe Winston is our quarterback and will be for a very long time. Pick a QB in the 3rd round, for sure. Many here recoil from the idea, seeing it as a threat to Winston, but what if he flounders, what if he’s injured, what if he makes unrealistic demands going forward? Competition is good except for you-know-who? And if nothing else you may find yourself with a valuable trade. The angle to this scenario everyone is overlooking is this….what if Winston gets hurt early in the season and we go another year without any definitive conclusion? In 2020 he’s a free agent….then what? Franchise tag him for $25+ million to look again? Do that and you risk going down the same path as Kirk Cousins with the Redskins. I firmly believe we HAVE to draft a prospect….If Winston goes down, we can at least salvage the season with grooming a young QB to see if we can let Winston walk. We just might find a Garrapollo or Carr who would be just as effective AND save a ton of money with a cap friendly deal….all while under the mentoring of Arians. Winston has had plenty of time to prove himself…this is business and the smart business move is to hedge your bets. lot of fans say the team loses because it just can’t get out of its own way. lot of commenters here say they don’t have faith, belief, hope, positive expectations because of the team’s history. not the same coaching staff. not the same team. get in the present. the “team’s” history is not as relevant as you think. It’s obvious that the Glazers by bringing in Bucco Bruce has given another opportunity to succeed. Now a highly ranked LT and an above average running back from FA and/or the draft will optimize chances for his success. Jameis has to be successful this year or he’s gone. But I disagree that a mid-round qb this year is the answer. Tua and Fromm should come out in 2020. If we need to, that’s when to draft a qb, not reach for mediocrity this year. Only a true nightmare scenario would allow us to pick them (unfortunately) or have a shot at Trevor Lawrence in 2021. Like the way you think. We should always try and remain in the moment in life. And a positive attitude leads to more success than a negative attitude. What I do not understand is why folks apparently would rather be depressed before the season even starts instead of embracing the joy of optimism. If the optimists are wrong there will be plenty of time to moan and groan. OTOH if we win 10 the negative nellies will have wasted all their misery. Agree completely. This team lost last year for a lot more reasons than JW…DK…bad OL…bad defense…several players that we know of mailing it in. it was truly a TEAM effort or lack thereof. JW will be depending on this TEAM as much or more than they will be depending on him. If the team plays well…so will JW. What middle round AB (especially in this turd of a draft class) is worth a pick? Answer: None and no one. You don’t use middle round picks on QBs. If they were good, they’d be going early. Spare me the fluke Wilson and Brady nonsense. Can it happen? Sure. But it’s irresponsible to make a play for that. Draft OL and DL in those middle rounds. Safeties and RBs. DEs, CBsand QBs worth anything are long gone at that point. Don’t throw away draft picks on a guy who will eat a roster spot for 2 years and then you’ll throw in the trash. 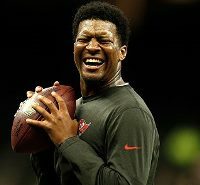 Bucs are stuck with Winston and he’ll likely get that contract the media keeps guessing the glazers are not sure about. Because fans don’t like him doesn’t really mean much at all. We tried drafting a third round pick with freeman in the building and it was just a stupid move. If your unsure go after a quarterback instead of wasting a mid round pick on another mike glennon type quarterback we will end up replacing with a high draft pick the next year when Winston is gone. If Bucs are all in with Winston, then all of their draft picks should be for trench talent and linebackers. Bucs already have receivers, tight ends, secondary (when healthy) and yes, running backs – Barber and Jones aren’t going anywhere. They can pick up a backup qb ,cornerback, another rb in free agency. You can’t count on Kwon and Beckwith due to injuries. If they pick DLineman and 2 OLinemen with 1st 3 picks, outlook will be much better for future. Its funny when some have the answer, but keep asking and just waiting for some one to tell them what they want to hear!!!!!!!! Did Ryan Griffin go away? I think we already have our backup QB in him, especially working with Arians. Joe, is Griffin a free agent? At the end of the Podcast, you guys mentioned how the team got better after Kwon Alexander was injured.